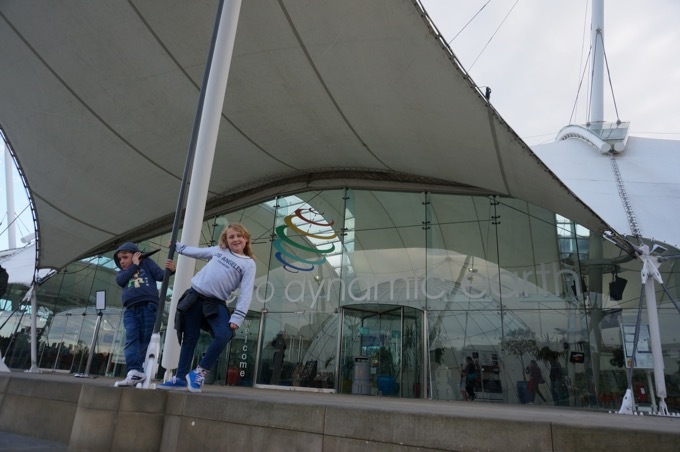 Yesterday Penny shared 10 reasons why the Malmasion makes a great base for families in Edinburgh, today she shares a three day Edinburgh family break itinerary. 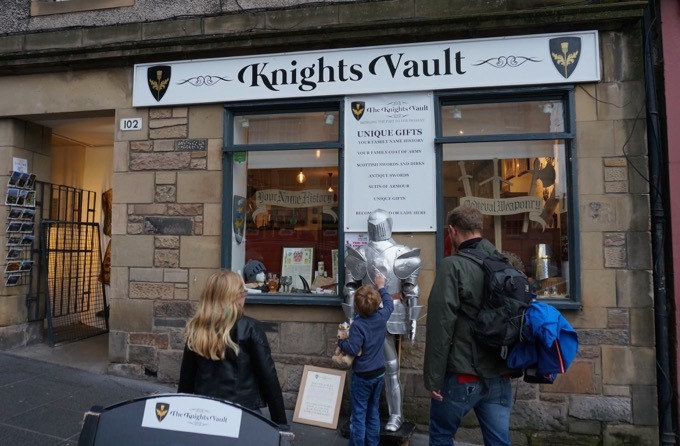 No need to stress over planning your visit to Edinburgh – history, culture, family friendly shopping, cultural cake stops – it’s all covered and fully tested by a real family. 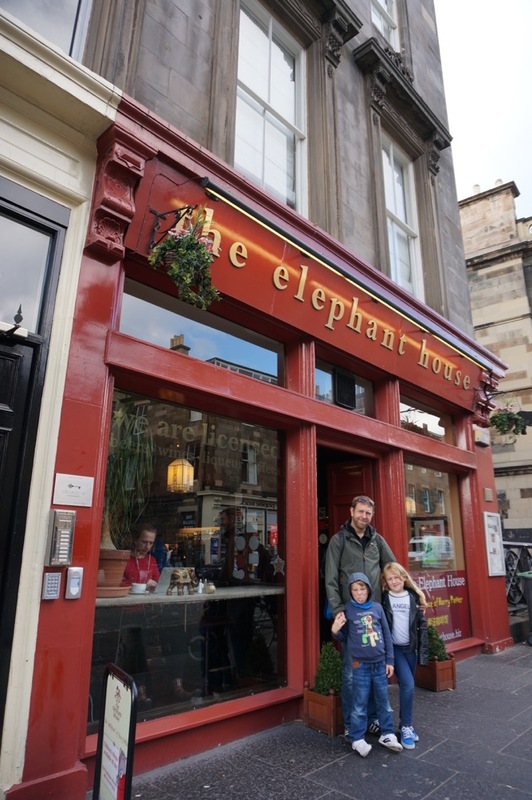 Edinburgh is such a great city for family breaks; compact, easy to navigate, bursting with history, incredible attractions and museums. 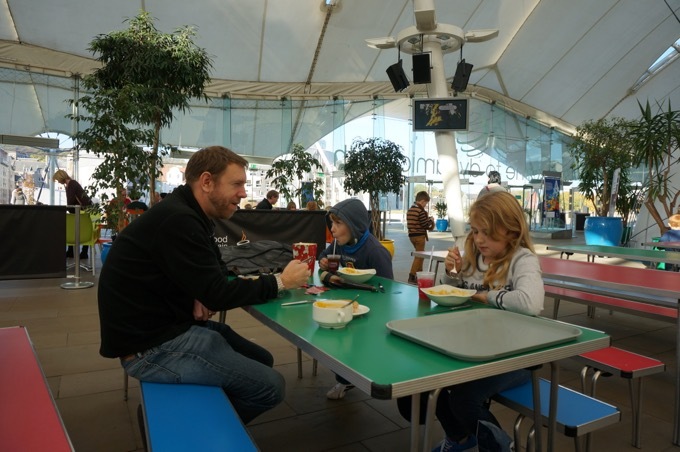 You are spoilt for choice for great places to eat and there are plenty of open spaces for kids to run free. 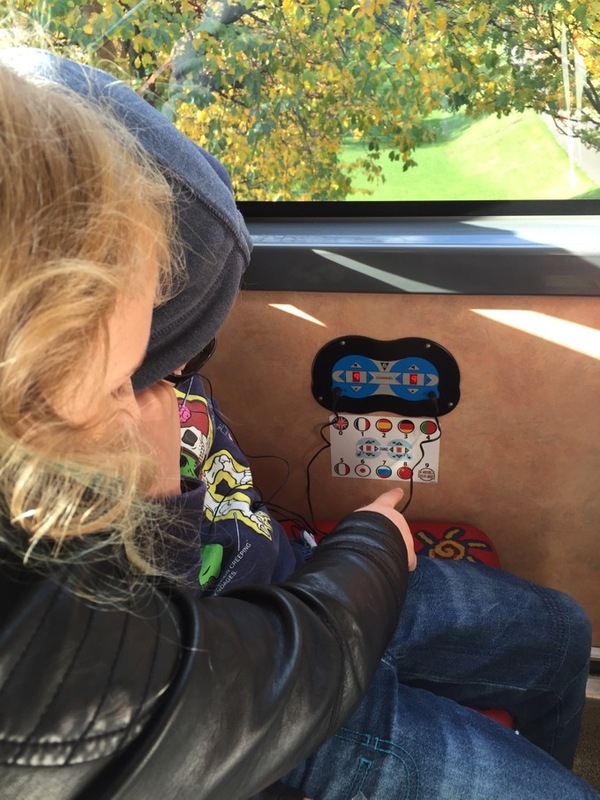 My children are 6 and 9, but there is plenty here to adapt for younger or older children. 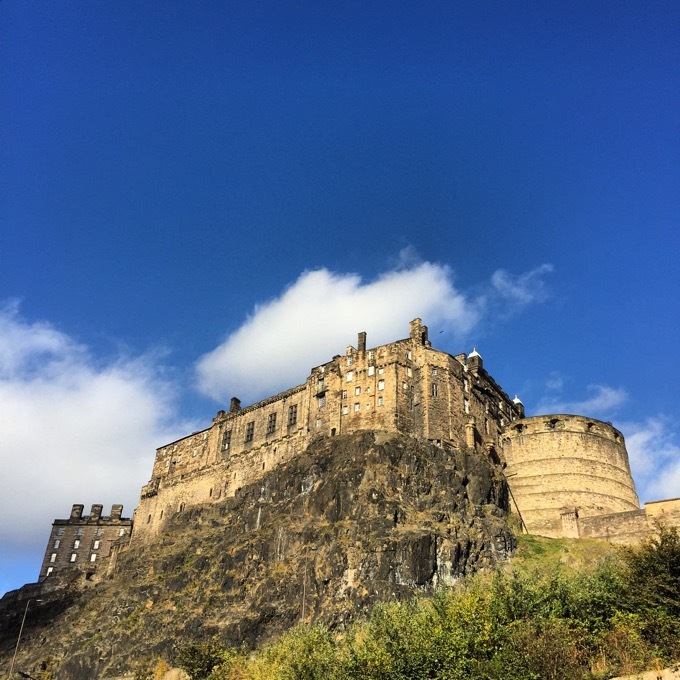 Start at Edinburgh Castle, the majestic view over the city, to the Firth of Forth, gives you bearings, and a whole new perspective on the city. We approached it from Princes Street through West Princes Street Gardens, which gives you a sense of what it might feel like to try and ambush the place. 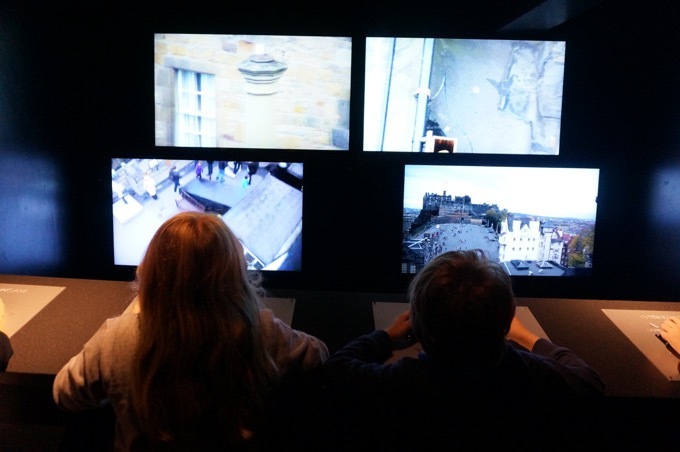 Once inside the walls, the castle is jam packed with things to explore and interesting vantage points. 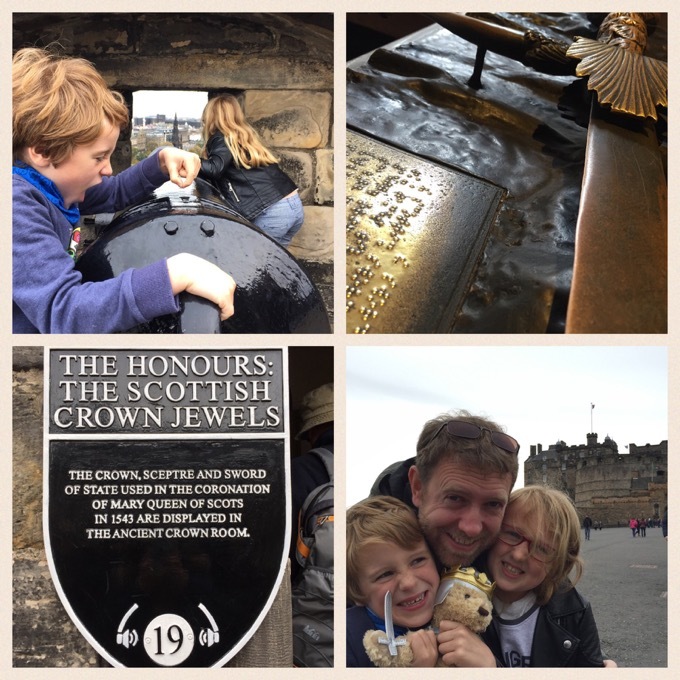 Mine couldn’t wait to get their hands on the canons and spying the Scottish Crown Jewels, you could try and time it to be around for the daily 1 o’clock canon. 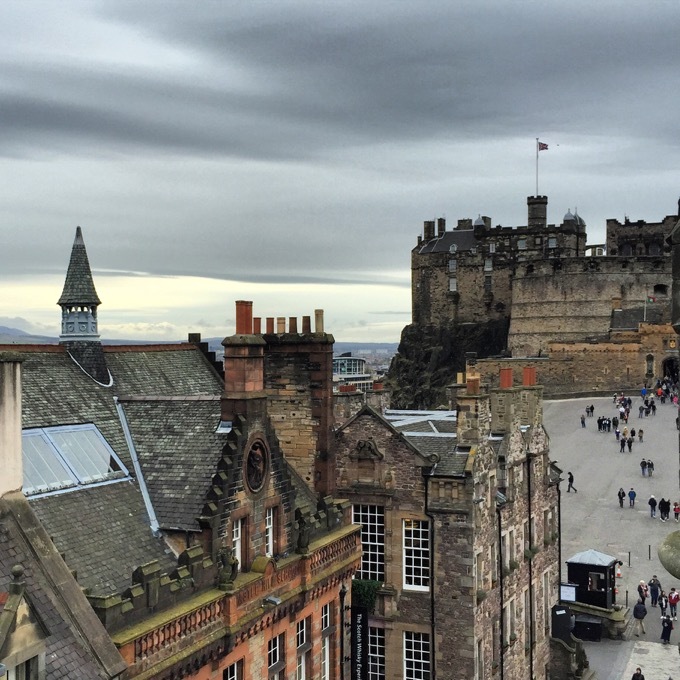 Have a tea and cake break or lunch in the castle cafe, with more stunning views over the city. 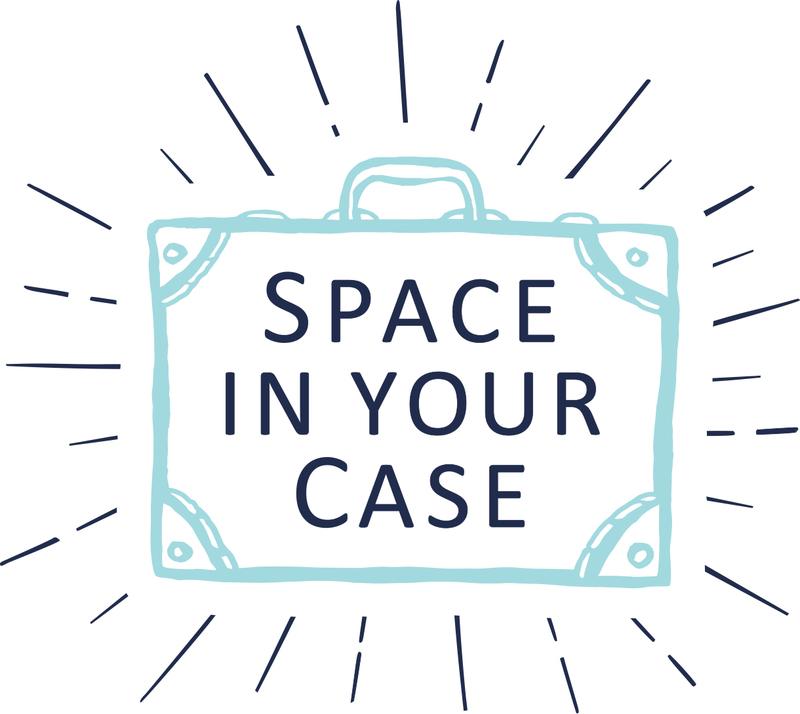 Next some shopping and pottering….after the castle head down Castlehill, carry on through the Lawnmarket, take a right at George IV Bridge and turn right at Victoria Street. Take your pick of amazing shops for children and adults, the Red Door Gallery, on Victoria Street, is full of gorgeous gifts, prints and nick nacks and was recommended to me on Twitter. 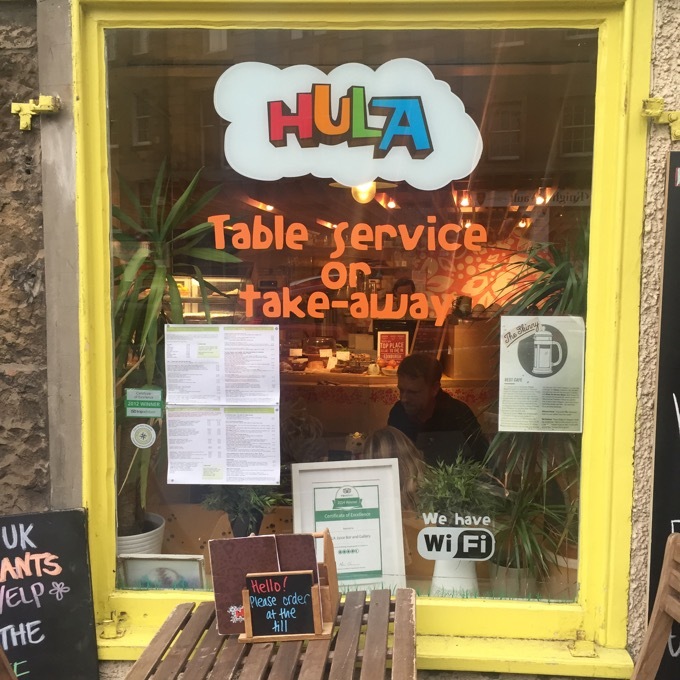 We ate lunch just down the hill from here at Hula on West Bow, which does great smoothies, bagels and cakes, but there are lots of lovely places. 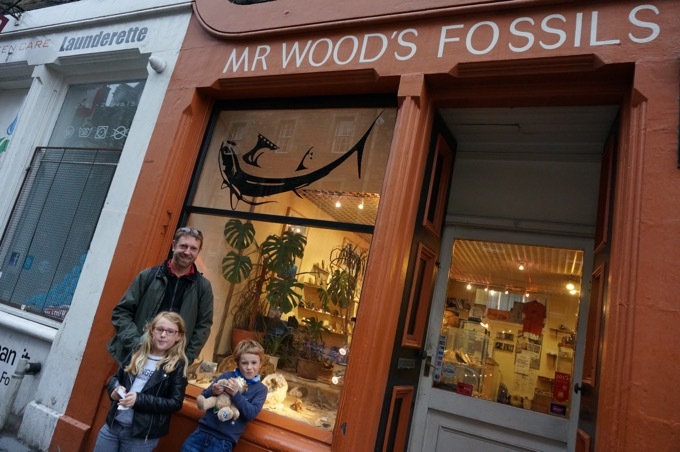 We also loved the Ahahaha Joke shop, Knights Vault and Mr Wood’s Fossils. From the other end of the Grassmarket, you get a lovely view of the castle, the sun even made an appearance. 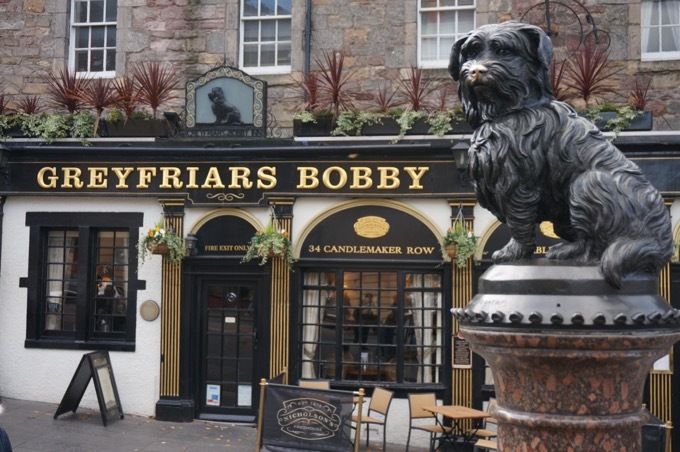 Or, from the fossil shop it is only a short walk to Greyfriars Bobby, on the corner of the Grassmarket and George IV bridge. I made finding him a bit of a treasure hunt which mine enjoyed. Enjoy the sights, there is a signed copy of the first Harry Potter book in a glass case and the graffiti in the toilets is worth a read. 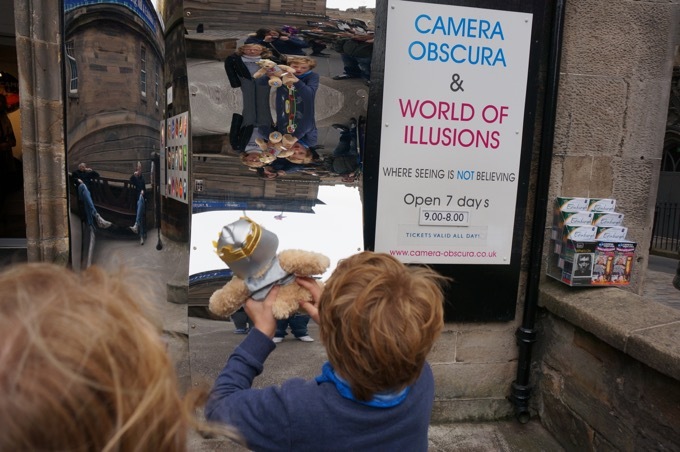 Head back towards the castle and explore Camera Obscura on Castle Hill, which is packed full of incredible illusions, seeing is believing, so here are some of them, our favourite was operating the CCTV cameras over the city, and the mirror maze. 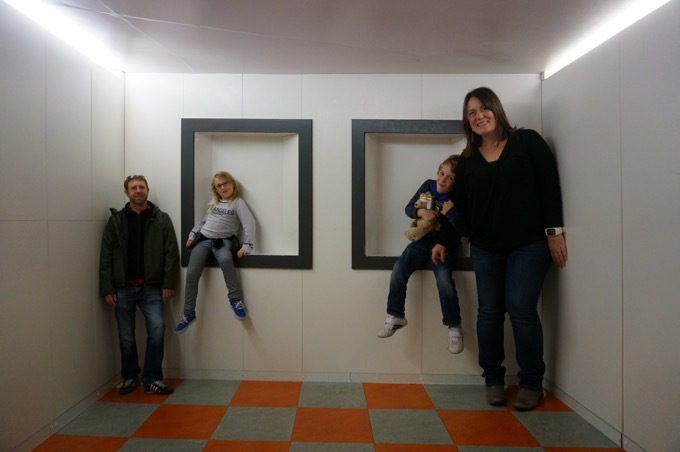 The view from the Top of Camera Obscura is also amazing. 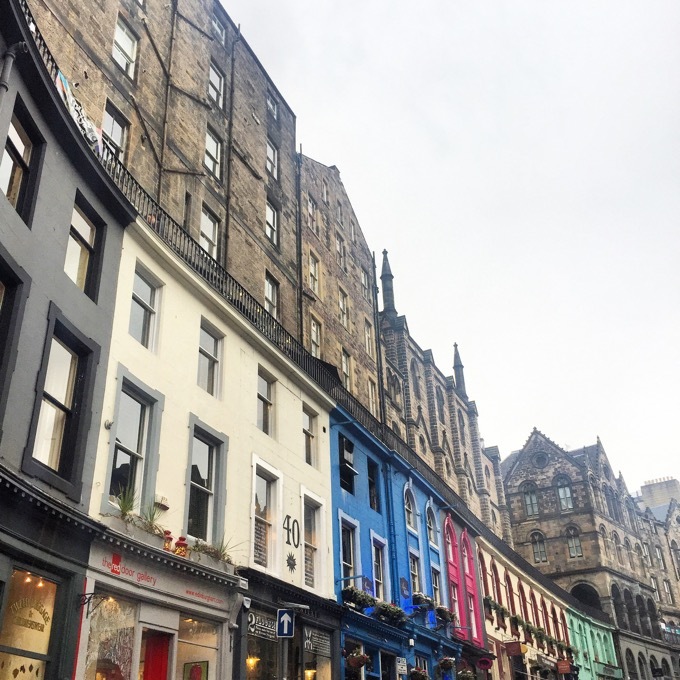 If you have any energy left, you could head onto The Royal Mile for some shopping, or to size up the evening ghost tours. We started at the Waverley Bridge, where we picked up our tickets for the Hop On, Hop Off Bus. 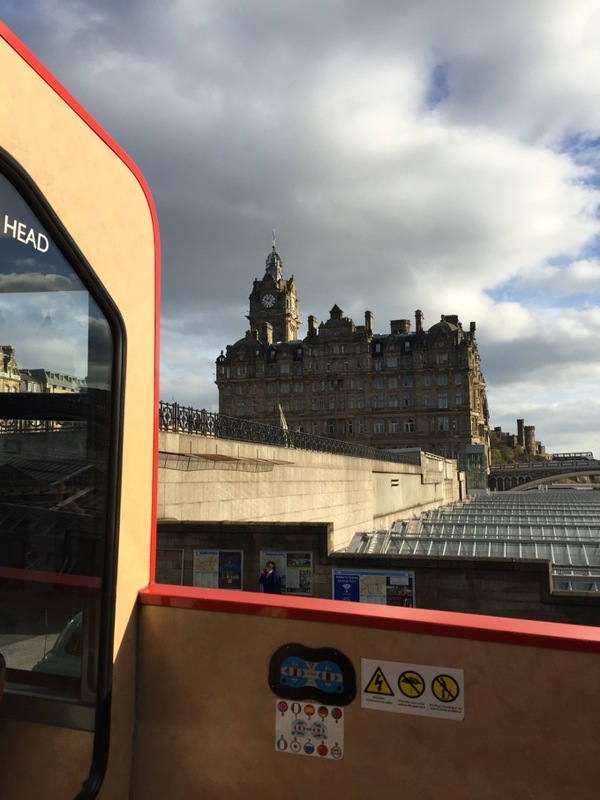 This is so versatile, you could use the tour to see all of Edinburgh if time in the city is limited, you can hop on and off over a day as you leisurely take in the sights, or you could use it across two days, an afternoon and the following morning as it is valid for 24 hours. It even has a Horrible Histories soundtrack, mine were sold! 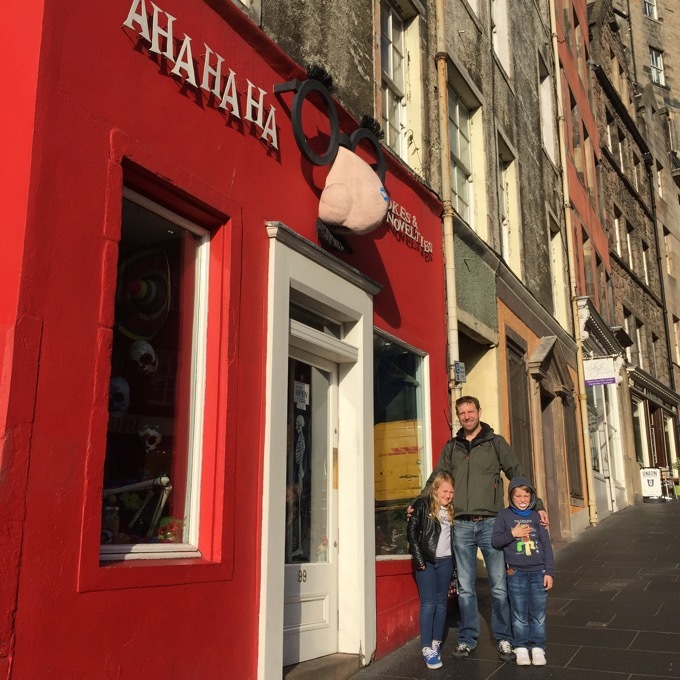 We hopped off near the Royal Mile to finish the previous day’s shopping, Scottish sweets, rock and tablet are very hard to resist, but they do keep little legs moving! We stopped here for lunch, which was simple, but kid friendly food. 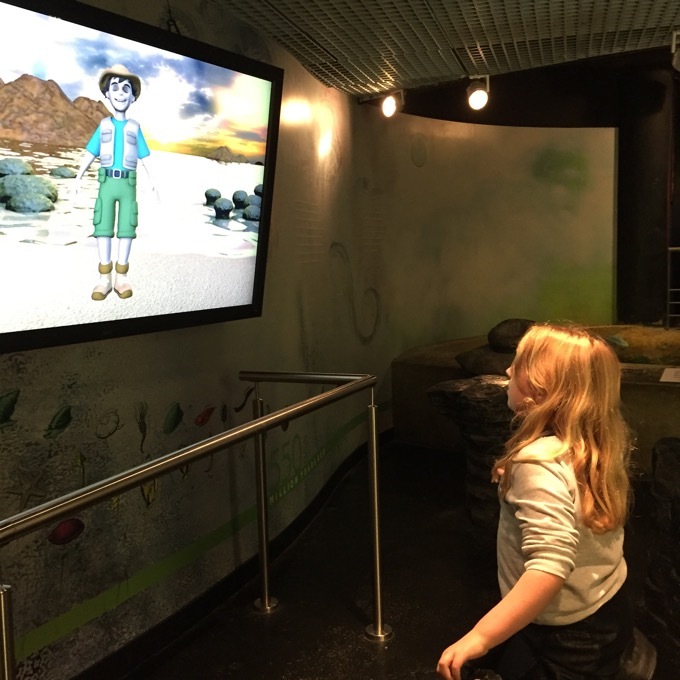 My daughter loved that this interactive character could answer any question you posed him, I was quite taken aback when we realised there was a real voice behind him. He explained all about the fossil my daughter bought the previous day! 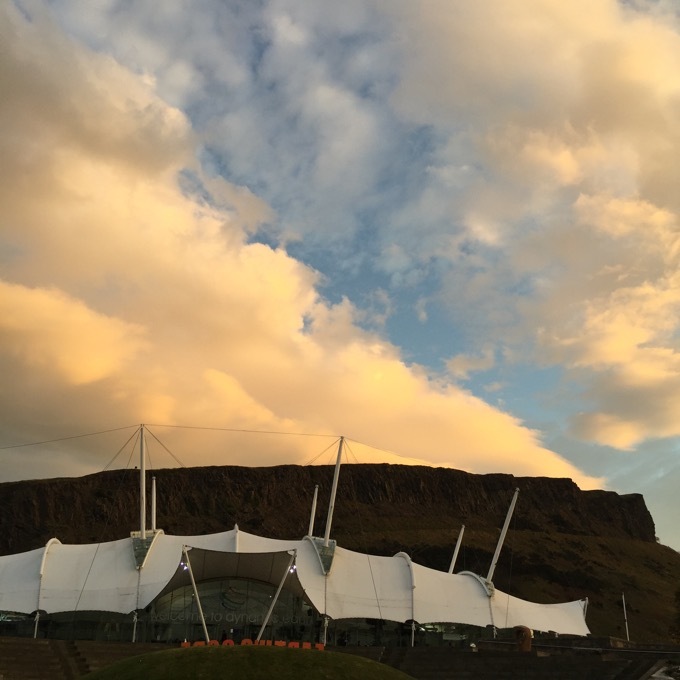 The 360 film about the stars and universe was awe inspiring, as was stepping back out into the real world as the sun set on Arthur’s Seat, a dormant volcano behind Our Dynamic Earth. 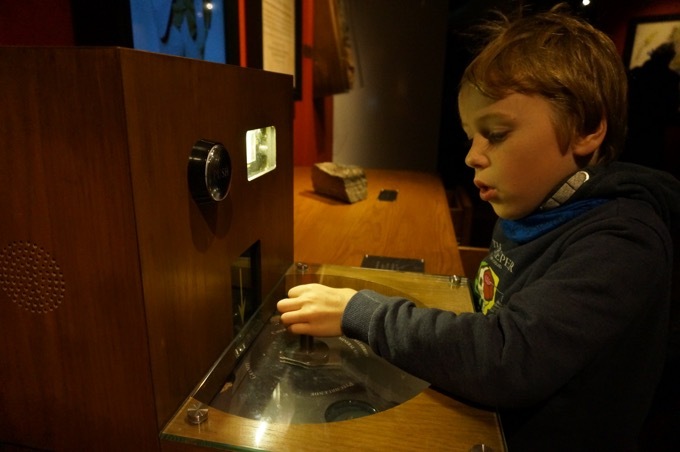 The experience gives you a real sense of how earth is shaped, locally and globally. Ideally we would have climbed this, but my son had a bad cough and cold, but you must for the views! 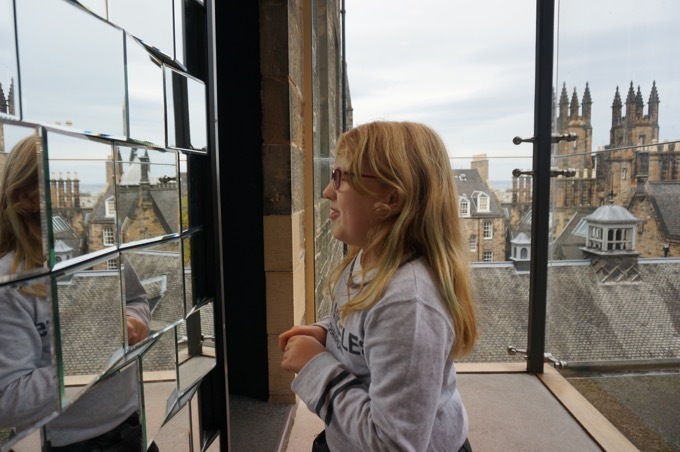 The Palace of Holyroodhouse and Scottish Parliament is also in the same area if you fancy making a longer day or a different spin on Edinburgh. The Hop On, hop Off Bus bus then goes on to Leith where we stayed at The Malmaison Hotel. 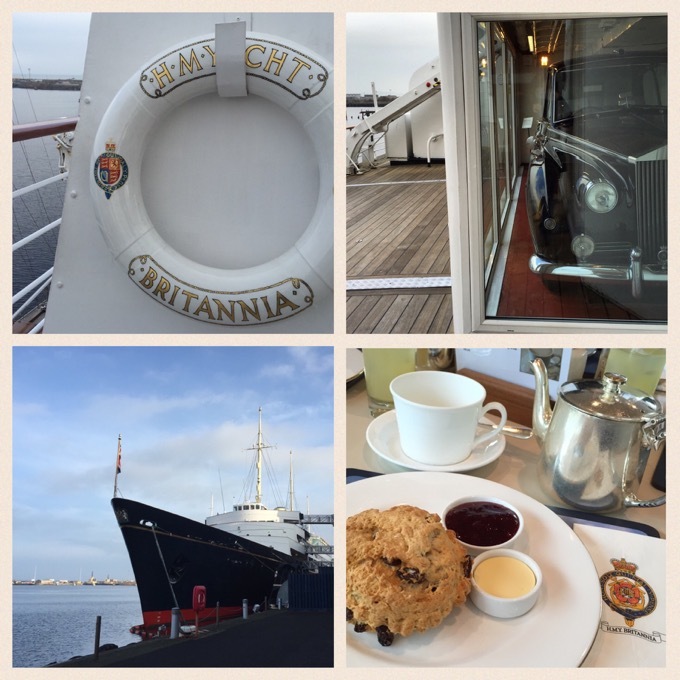 Leith is also the site of the Royal Yacht Britannia, which is another great place to stop and explore on the tour. 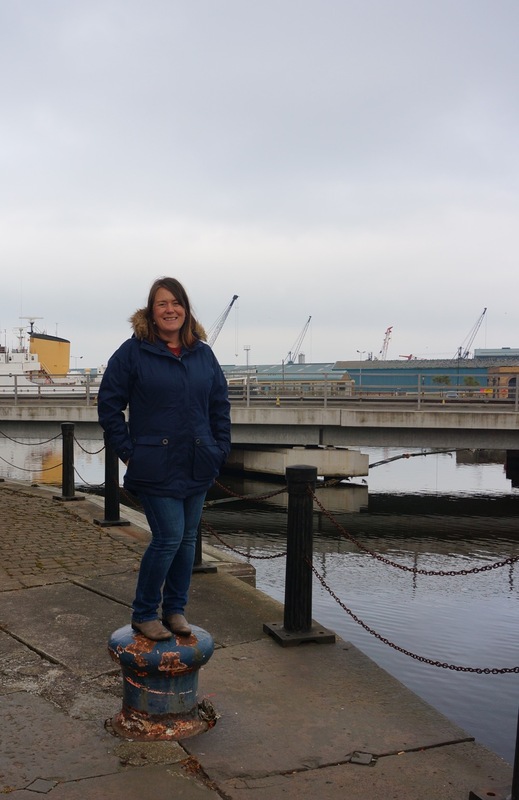 After breakfast at The Malmaison Hotel we took the 10 minute walk to Ocean Drive shopping centre from where you can access the Royal Yacht Britannia. On the way we spotted an Anthony Gormley Sculpture and got excited to see the sea, or in more strict geographical terms, the Firth of Forth, the sea is a little further out. For over 40 years the Royal Yacht Britannia was where the royals could travel, escape, entertain, celebrate and also a refuge in emergencies. Charles and Diana honeymooned here and the Queen is said to have cried when it was decommissioned. 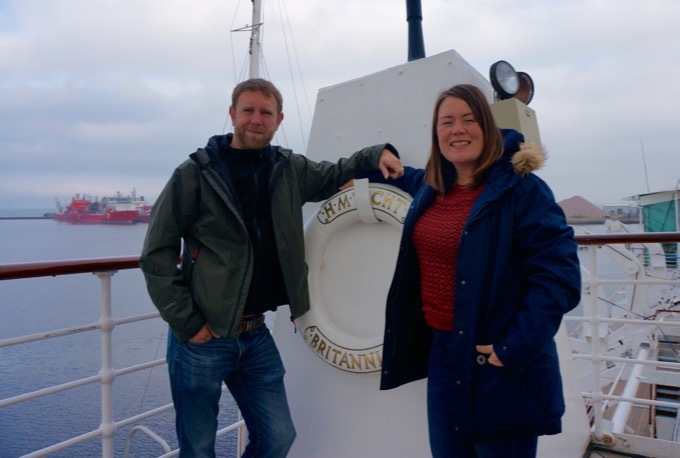 Wearing coats from Sprayway on the flag deck, perfect for the chill on the Firth of Forth, and designed by dingy enthusiasts. 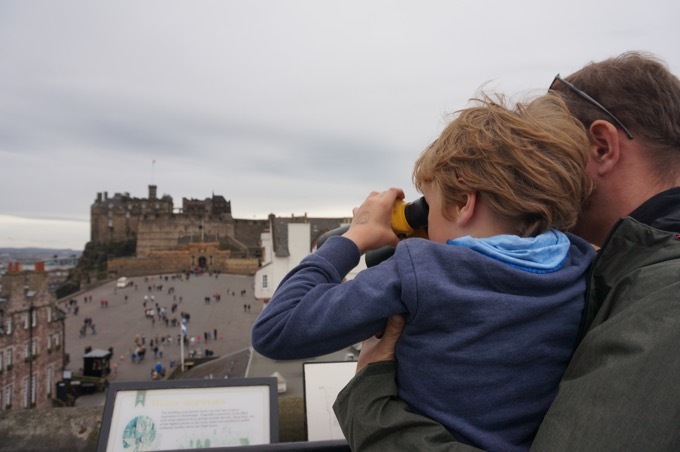 The tour audio guide kept my 6 year old and 9 year old entertained and I’m no royalist, but all aspects of the yacht, from the royal bedrooms, to the flag deck and crew bunks, are fascinating to snoop around. There is even a Rolls Royce and garage on board. 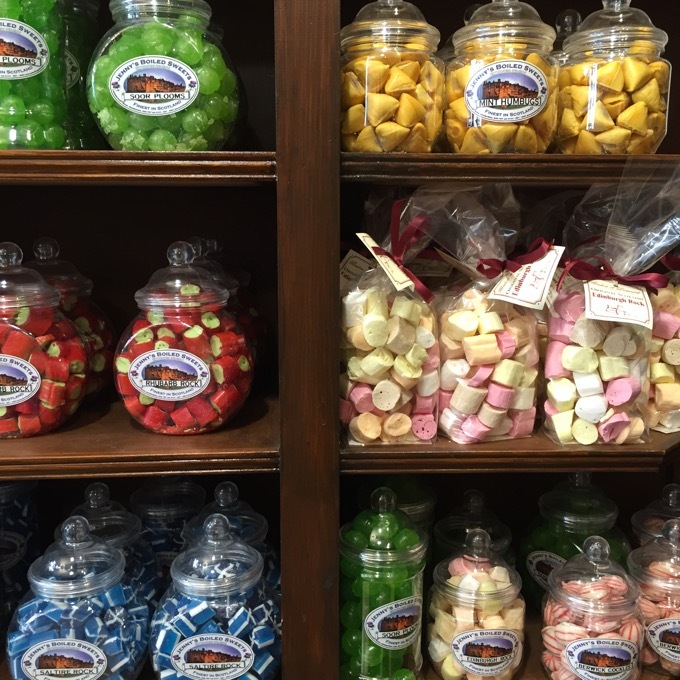 There is a little sweet shop part way round the tour and the tea room is a rather royal treat. Arrive early, we arrived as it opened and there were no queues, as we left before lunchtime the queues were out the door. 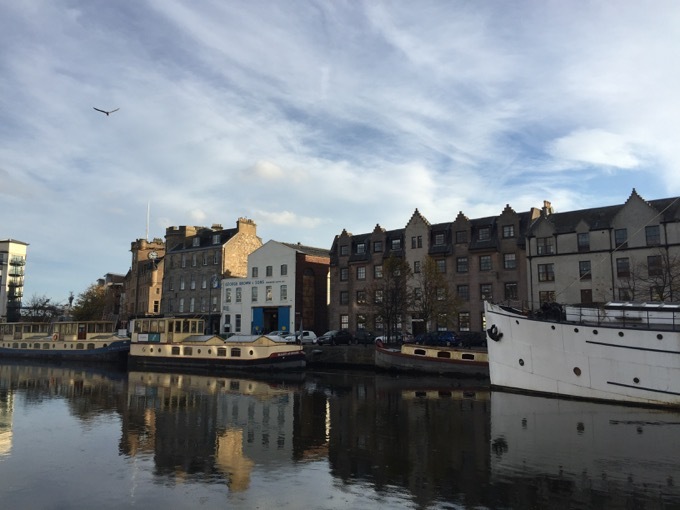 There are shops and eateries and a cinema in the Ocean Drive centre, but it is also a short walk to the waterside at Leith with lots more interesting restaurants and art galleries. 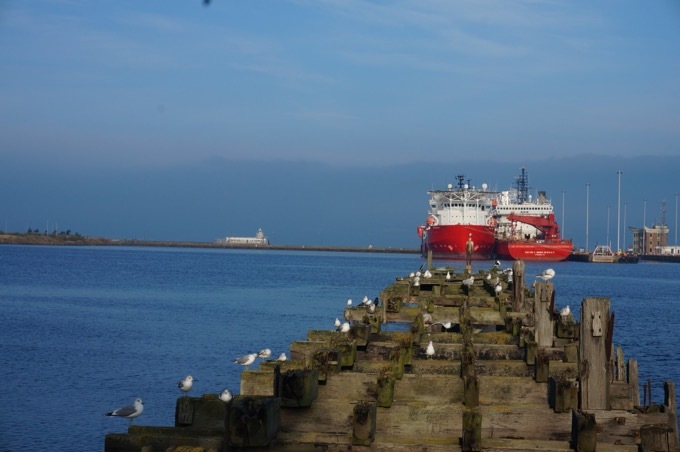 For more ideas on what to do in Leith check out this post, or to find out more about our Sprayway coats, check out this post, jumping on nautical relics optional! 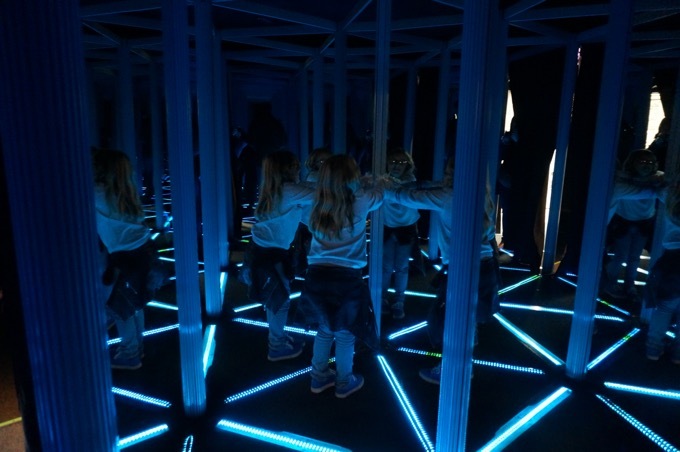 Other great places we didn’t get chance to visit in Edinburgh: The National Portrait Gallery, The Scottish National Gallery, The Royal Botanic Gardens, The National Museum of Scotland. The Ghost Tours and Bus also looked great fun and catered for different age ranges and levels of scare. Malmaison Edinburgh, more information on our stay here.